Niteworks fuse the Gaelic language and traditional music that was central to their upbringing on the Isle of Skye with electronica and techno to create an electrifying and genre-defying sound. 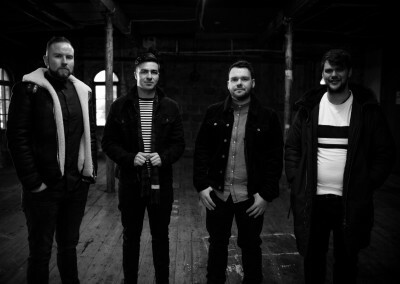 The band, comprising of Innes Strachan (Synth), Allan MacDonald (Pipes), Christopher Nicolson (Bass) and Ruairidh Graham (Drums), are set to have their busiest year in 2018, which will see the release of their second album; the follow up to their critically acclaimed ‘NW’, released 2015. Their second album, to be released this summer, sees the band’s sound mature. Overseen by acclaimed techno producer Alex Menzies (Alex Smoke), and featuring appearances from notable acts such as Julie Fowlis, Iain Morrison, Ellen MacDonald, Sian and Kinnaris Quintet, it is a record that blurs the lines between Scottish traditional music and contemporary electronica. The band welcomed in the New Year at Edinburgh’s Hogmanay 18 having been asked to curate the music to accompany the expansive fireworks display, broadcast not only around Edinburgh but live on BBC Scotland. The band also played to a sold out 12,000 audience at the SSE Hydro in Glasgow at Celtic Connections.